The Comedy of Terrors. American International Pictures 1963. This was a random find. I’m not even sure what got it recommended to me, but it looks fantastic. I somehow got the impression it was from the 30s/40s era it claims to be spoofing, but was rather surprised to find it’s from the early 60s. 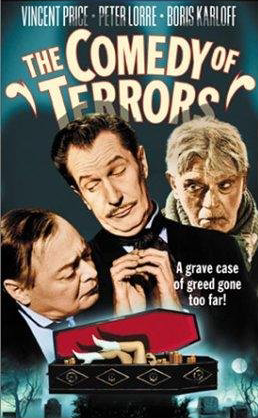 Anyway, here’s a star-studded cast of horror actors (and Basil Rathbone) in a comedy about a mortician who takes a proactive approach to getting clients. It looks like it’s been unfairly forgotten. Waldo Trumbull, undertaker, spends all his money on liquor, steals the coffin back after the service, openly loathes his wife (whom he only married to acquire her doddering father’s business), and is a year behind on his rent. When his landlord gives him an ultimatum, Trumbull takes a hands-on approach to getting clients: with the help of his assistant, he breaks into rich old men’s houses and kills them in their sleep. But when he realizes his landlord would be a choice client, he discovers that this particular man has a hard time staying dead. The main way I can put my finger on that this defied my expectations is that I expected this to be an ongoing scheme with great success until the one job makes it all fall apart. While it’s mentioned that they do this from time to time when they’re short on money, we only see two client procurements, and spend pretty much the entire movie with the second one. It’s also not as funny as it sounded, but that’s a little more involved. I expected Vincent Price to be a creepy, refined undertaker, but he’s very much not. This is an improvement, since instead of being a straight man, he gets to really show off his comedic skills. I don’t think there’s a single scene where the man is fully sober. In the movie I had in my head, Peter Lorre was typecast as a creepy, devoted sycophant, but he’s also not at all creepy. His character is Trumbull’s put-upon assistant who regrets what his boss forces him to do instead of just being an honest burglar. But the most surprising cast member is Boris Karloff. The man best known for Frankenstein’s Monster and “How the Grinch Stole Christmas”, I expected his role as Trumbull’s father-in-law to be a severe, disapproving man. Instead, he’s a sweet, senile old codger whose hearing and eyesight have gone so far he doesn’t know what’s going on pretty much all the time. I might not have noticed it if it hadn’t been for the landlord, whose lines are mostly from Macbeth, but this story has much stronger Shakespearean overtones than the throwaway pun in the title. The whole thing reads like a play adapted to the screen (it isn’t), and the finale manages to make a very traditional tragic ending into an absolutely genius comic sequence, which more than makes up for the slight drag in the middle. This didn’t live up to my expectations, but despite going the opposite direction at pretty much every turn, it’s still a very enjoyable, fun film more people should see. If any of those people figure out a reason the cat was important enough to include, they should let me know. Watch this movie: For a bunch of big name stars having a wonderful time playing against type. Don’t watch this movie: For shadowy figures in graveyards and lurching monsters.